The JJR/C HY-90 is upgraded with the latest image and video transmission technology, equipped with advanced 720P Wi-Fi Camera, providing high resolution that help you capture every aerial moment. It provides a 10 minutes stable flight, you can play with your kids and friends. With the GPS positioning system, the drone will follow you and track your every move. You will experience safest and most fun flight ever! 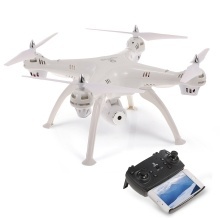 Functions: 4CH 720P camera, Wifi FPV, App control flight, GPS auto return, follow me, altitude mode, user-defined flight plan, orbit mode, one key taking off/landing, camera angle up/down, headless mode. 720P Camera: 720P HD camera with real-time transmission function helps you capture every aerial moment, offering a thrilling flight experience. 2.4G Remote control up to 500m control distance. And App control provide you with clear and fluent live video up to 300m far away. GPS Auto Return Home: GPS positioning prevents drone loss; the drone will automatically return to home when its battery is low or loss signal. User-defined Flight Plan: Enables the drone to fly according to a prepared route via APP interface. Easy and Fun to Fly: Assisted with Headless Mode, Altitude Hold and One Key Taking off/landing functions and up to 10 min flying time, perfect drone for kids or beginners. Follow Me Mode: The drone will automatically follow and capture your every move; you can take photos or videos the way you like, ideal selfie drone. * There could be a few deviations due to manual measurement or slight color difference owing to photographing condition. Thank you for your understand. * Please do not use in many WiFi situations, there may be signal interference. If any problem, please contact us as soon as possible. * The Drone has GPS function. Please fly the drone outside or at open places and make sure that there are at least 8 satellites are received. * This RC model is not a toy and is not suitable for children under 14 years old, keep it away from children. Carefully read the instruction before any use, if you are a beginner, it&apos;s advisable to be assisted by an experienced adult. * Don&apos;t over-charge, or over-discharge batteries. Don&apos;t throw it into fire or water.